Happy Saturday everyone! I hope you are all having a wonderful summer and finding lots of time to create! I love all things hearts, flowers, and butterflies so today I am sharing projects that feature all three! 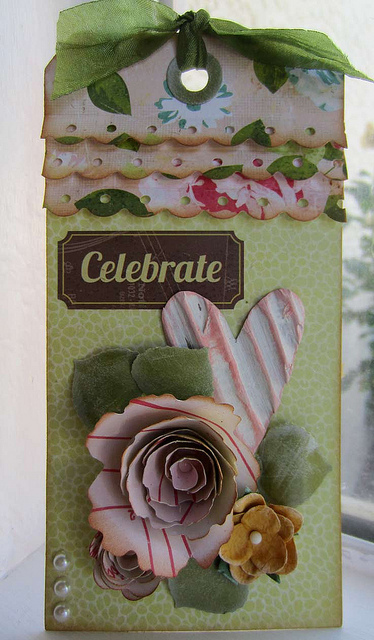 These projects were all shared with us in our Sizzix Gallery on Flickr. If you are a Flickr user, I hope you will take a moment to join our group and check out all of the great inspiration there. Feel free to jump in and share your Sizzix projects there as well. We would love to see what you create with Sizzix products. If you do, you just might find your projects featured here on the Sizzix blog. Vivian has so many lovely projects in our Flickr group that it is hard to pick just one to share! I love the combination of vintagey pinks and greens along with the cluster of flowers, leaves, and heart. Vivian's Flickr photo stream has lots of great inspiration, you can find it here: http://www.flickr.com/photos/contadinak/. You can also find her blog at http://contadinak.wordpress.com. Chris Slater shared this vintage style embellished envelope with us that features the Tim Holtz Pocket Envelope. I love the soft feminine colors of this project and the sweet vintage image of the young girl. Wouldn't this envelope be such a sweet little gift? You can see more of Chris' projects on her Flickr stream here: http://www.flickr.com/photos/13953080@N04/. Irit from Albomy shared this gorgeous clear project with us. 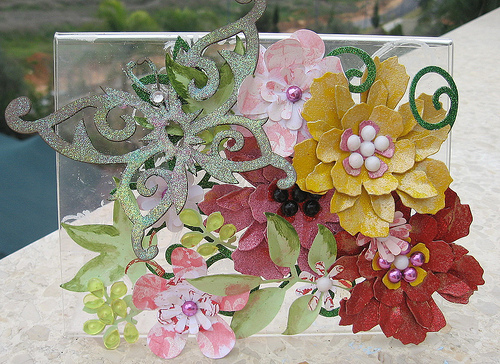 I love the layers of flowers she included and the watercolor like accents added to the leaf die cuts. Be sure to check out her Flickr photostream for even more projects featuring amazing layering: http://www.flickr.com/photos/13953080@N04/. Finally today I wanted to share with you an explosion box by Luanne Pang. I love the layering of flowers and leaves along with the heart and butterfly. The wonderful layering doesn't end with the lid, there is another gorgeous cluster of flowers inside the box! Luanne has several more explosion boxes in her photostream that you will want to see! Find her photos here: http://www.flickr.com/photos/thecraftersreference/. It's great to see one of my friends, Chris Slater, featured here as I loved the envelope pocket she made. Fabulous love the Robin's Nest flowers! Thank you so much for featuring my envelope. It was a wonderful surprise to see it on your blog. Fabulous work from the other crafters too. wow wow! Thank you so much for featuring my exploding box. Big surprise! Lovely projects from everyone too.